Knowing Chalicea’s penchant for alcoholic beverages, I scanned the clues for evidence of her insobriety. I was not surprised to find that, out of 48 clues, 26 of them contained a G&T. Indeed, nearly a third of them contained two, and 18ac an outrageous three. It’s a miracle the clues made any sense at all! At the start, I didn’t know whether this would be one of Chalicea’s gentle puzzles or a slightly trickier one. 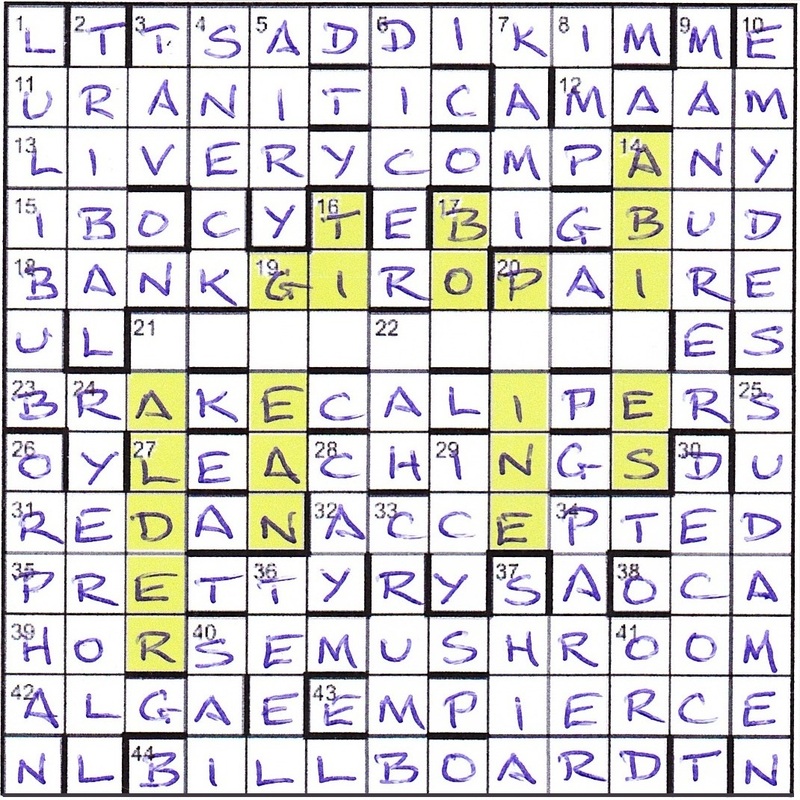 After a quick scan of the across clues, with only seven inked in, I thought it might be a bit of a toughie. I was pleased that I got one of the three 13-letter entries with 23ac BRAKE CALIPERS across the middle of the grid. The downs were slightly easier, with nearly half of them solved on my first pass, and after 45 minutes, things looked rosy. However, none involved a clash with a crossing entry. 1ac TSADDIKIM came next, and after that, the remainder of the grid was fairly straightforward. With the BILLBOARD dropping, and being consigned to the SCRAPYARD, “six examples of the ensuing loveliness” were revealed in the form of six trees: ALDER, GEAN, TI, BO, PINE and ABIES, all to be highlit. This entry was posted on 5 August 2016 at 4:00 pm	and is filed under Solving Blogs. You can follow any responses to this entry through the RSS 2.0 feed. You can leave a response, or trackback from your own site. M Mascher, I’ve just realised what you meant – sorry to take so long! The letter is intended for Mr J E Green of 63 Green Lane. If you can’t drop it through his door, I’ll ask him to collect it (hoping you still have it). Thanks.